The EFCC reacts to orders that the Federal High Court in Ado Ekiti ordered the body to unfreeze accounts of Ekiti State Governor, Ayodele Fayose domiciled in Zenith Bank. did not follow the laid down processes in freezing the accounts. EFCC reacts on their Facebook page. 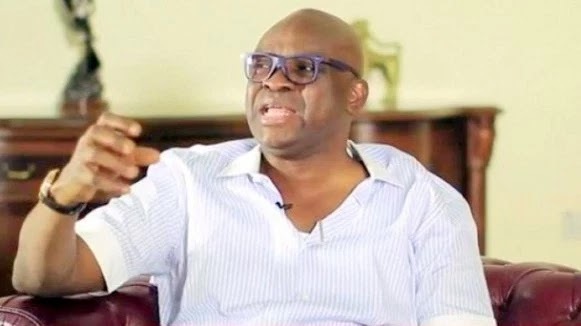 The attention the Economic and Financial Crimes Commission has been drawn the order by Justice Taiwo Taiwo of the Federal High Court, Ado Ekiti, Ekiti state asking it to defreeze the accounts of Governor Ayo Fayose in Zenith Bank. accounts pending the conclusion of investigation. 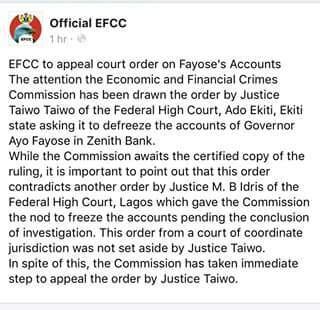 This order from a court of coordinate jurisdiction was not set aside by Justice Taiwo. In spite of this, the Commission has taken immediate step to appeal thenorder by Justice Taiwo.